The Beauceron is a large-sized, short-haired herding dog that originated in France. Dogs of this breed are intelligent, focused, obedient, and can be dominant and even aggressive if not properly socialized. Beaucerons require little grooming, moderate training (including plenty of socialization), and lots of exercise. They also suffer from few health issues. Overall, these dogs are best suited to working on farms, or as pets for active families willing to deal with their dominant personalities. The Beauceron, a member of the Herding Group of breeds, has existed as a multi-purpose farm dog for centuries, mostly in western Europe. With their "no-nonsense" work ethic, dogs of this breed are best suited as herding/work dogs, though they also make good companions to active families, particularly those living in rural areas. The typical Beauceron is the canine equivalent of a burly, no-nonsense police officer. These dogs are physically imposing, athletic, and strong--and their instinct is to always be in control. Though Beaucerons can be good family dogs if raised from puppyhood (and socialized with kids and other pets along the way), their tendencies will be to "herd" everyone and everything--no matter how domesticated they are. Beauceron dogs 101: they're natural farm dogs--but if they serve as family pets, they're best suited to living both indoors and outside. Though their coats are short, they have two layers of fur, so they will be comfortable outside even in extremely hot or cold temperatures. Don't be surprised, though, if when inside your Beauceron still tries to control where everyone is. Herding is its strong instinct, so a dog of this breed may nip at a child's heels in an attempt to keep the child under control. Beaucerons are also extremely playful as puppies, jumping and cavorting endlessly; owners contend that these dogs may not fully mature until up to three years of age. This level of hyperactivity may be overwhelming for small children, so Beaucerons may be better fits for families with older kids. Beaucerons will also need plenty of physical (and mental) stimulation. A simple daily walk won't be enough; these dogs need variety. They're strong, agile, and virtually tireless, so they will need varied activities to be part of their daily lives. Beauceron history begins centuries ago in France. 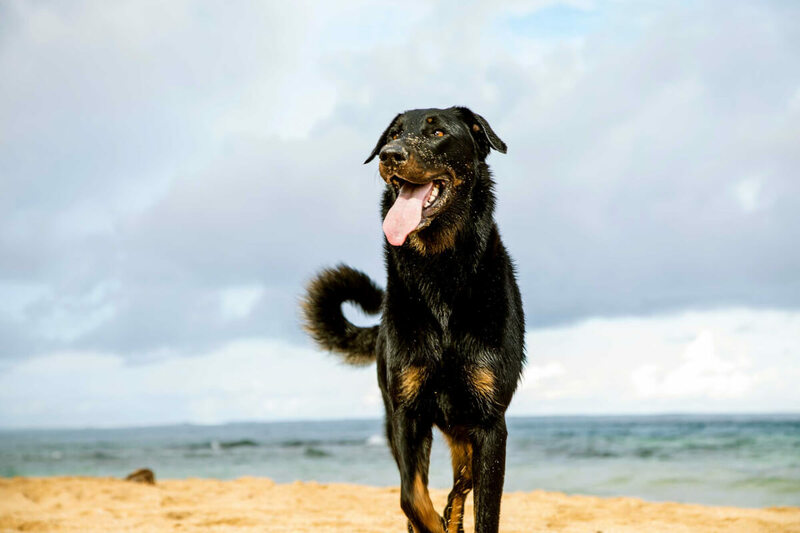 It's unclear exactly when the breed was first developed, but dogs of the Beauceron type are mentioned in Renaissance manuscripts from as early as the sixteenth century. 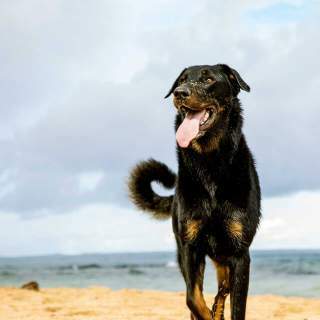 Historians believe that the Beauceron breed was originally associated with another, similar herding breed--one with a longer-haired coat--called the Briard, and it was long accepted that these two were simply variations of the same breed. In the late 1800s, a French veterinarian named Jean Pierre Megnin, in a book about dogs used in war, first differentiated between the Berger de la Brie (the long-haired Briard) and the Berger de la Beauce (the shorter-coated Beauceron); by the early 1900s, separate breed clubs had been organized for the Beauceron and the Briard, thereby establishing the Beauceron as a distinct breed all its own. In the decades to follow, the breed was used as a herder and protector of sheep and other livestock, as well as a rescue and attack dog for the French police and army forces. Today, the Beauceron is fairly common in Europe, though rare in North America. The breed was officially recognized by the American Kennel Club in 2007, and ranks 140th in popularity out of 202 AKC-accepted breeds. The Beauceron is a large but well proportioned dog standing up to 27.5 inches at the shoulder and weighing 70-110 pounds. They look athletic but the muscle is not bulky-- more like they are capable of great endurance. The French Beauceron has a short coat that lays close to the body and is coarse in texture everywhere except the head, ears and lower legs. The breed is also called the "Bas Rouge" which translates to "Red Stocking". This is because the black coat has tan markings, the most notable of which being the "stockings" that become less tan from the feet to the leg; tan is also present on the muzzle, brow, chest, neck and under the tail. There are also Harlequin coated Beauceron Shepherds. Other notable features include their dark brown eyes that always shine with a spirited confidence and a tail that slightly hooked end (slightly J-shaped). The ears are often cropped to stand forward-facing and erect but can also be shown in their natural state. Uncut Beauceron ears are fairly short and semi-raised; they fold over facing the front without laying on the face. 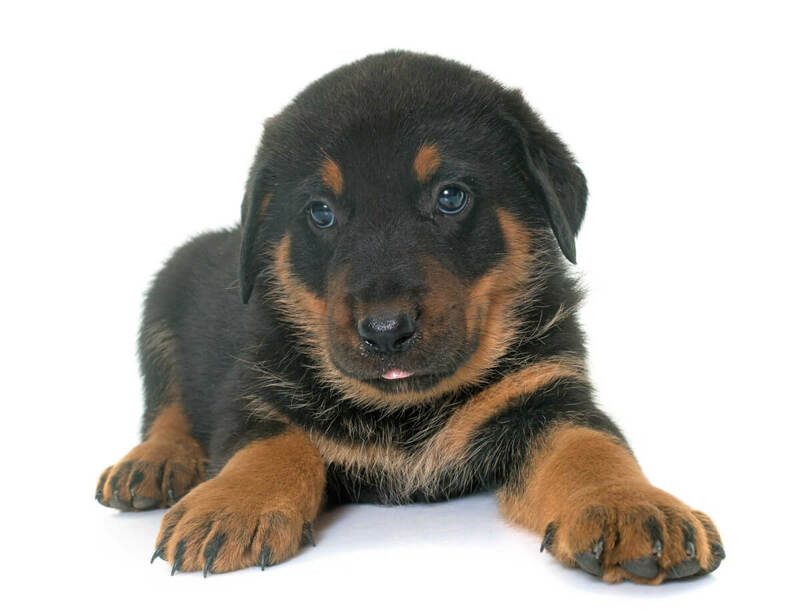 Beauceron coat colors: Black and tan is most common. A few breed members have tri-colored coats consisting of black, gray, and tan; also possible is a Beauceron of "harlequin," which is a primarily white coat with scattered patches of black (and sometimes blue or gray). 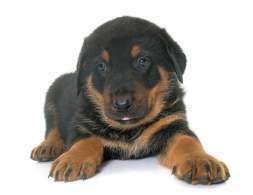 A large-sized breed, Beauceron size is 25-28 inches at the shoulders for males, and 24-27 inches for females. 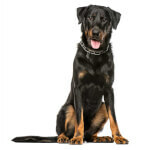 Beauceron weight for both sexes is 70-110 pounds. Beaucerons don't have major variations within the breed other than coat color-- most being black and tan while a few are harlequin. There are no additional size varieties such as mini, toy, etc. Interestingly, Beaucerons retain double dew claws that form a "thumb" that is positioned closely to the other toes; this is seen in some other Shepherd breeds as well. 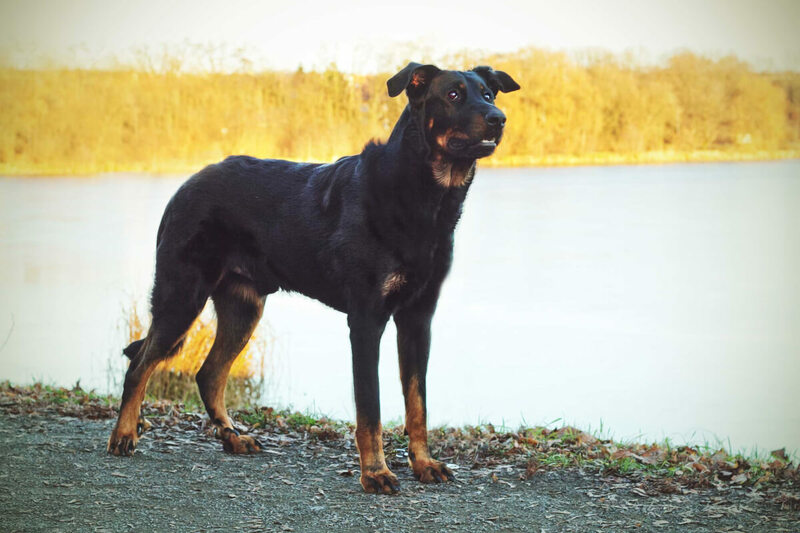 Focused, hard-working, obedient, intelligent, and at times stubborn and even aggressive, the typical Beauceron temperament is one of activity and control. Dogs of this breed have spent centuries herding and protecting livestock, so they instinctively try to control every situation. They can be affectionate and playful around kids and other pets, but they definitely need socialization (and the earlier in the dog's life, the better!) to minimize any dominant behavior once they mature. Beaucerons are intelligent and intuitive, so they respond very well to training--but only if the trainer establishes him- or herself as the leader. Consistent, firm training methods work best for these dogs; the teacher will need to be authoritative, but by no means harsh. An abused Beauceron is like the Incredible Hulk: you won't like him when he's angry. 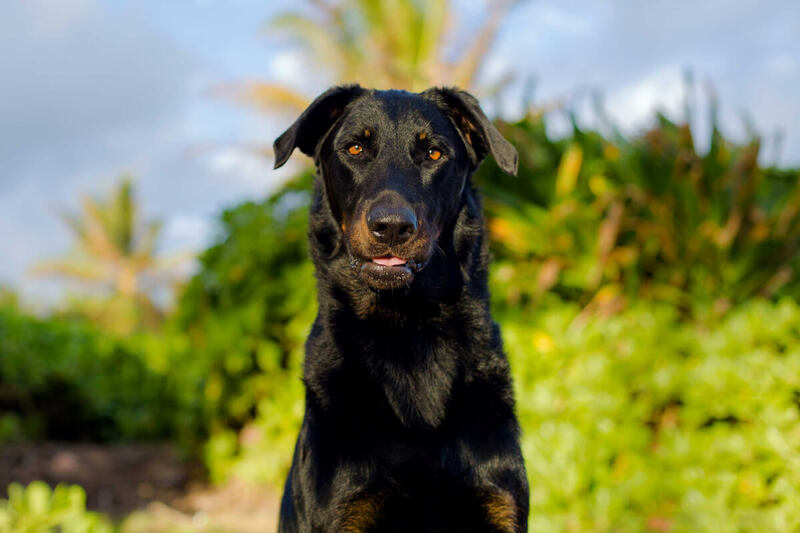 This dominant Beauceron personality, combined with a natural distrust of strangers, makes it a terrific guard- and watchdog. Breed members will take on any potential threat with confidence--and odds are, that threat will be neutralized. Beaucerons are exceptionally healthy dogs; the only known potential health issues are hip dysplasia and bloat. Life expectancy is 10-12 years.